Here’s the second in our series of stories of people who’ve shaped Liverpool’s history. If you have any comments, or want to suggest someone we should feature here, why not get in touch with us at Sarsfield Memorials Liverpool? 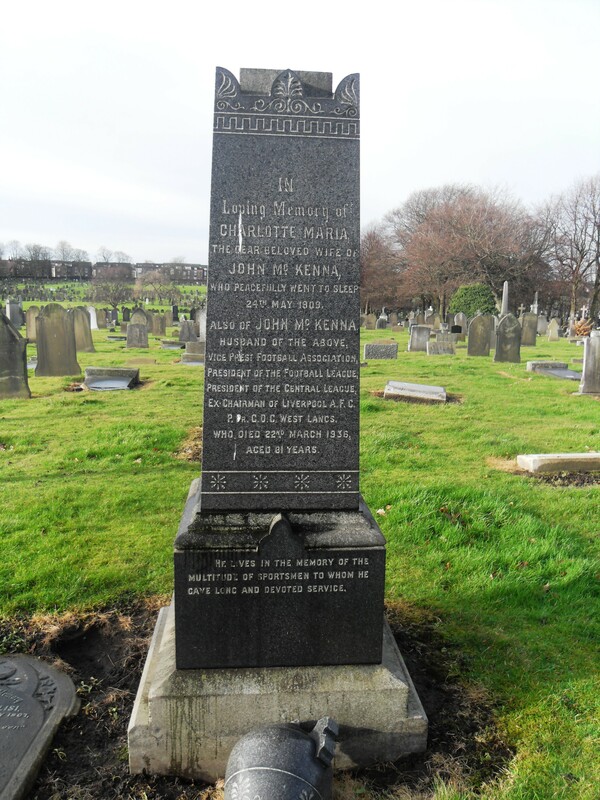 Born in County Monaghan, Ireland in January 1855, John McKenna moved to Liverpool in search of work on the 1870s. A keen rugby player, John transferred his allegiance to Association football after being asked by his friend John Houlding to watch Everton in action at his Anfield stadium. When Houlding – a shrewd businessman – raised the rent Everton paid to use the stadium in 1892, the team rebelled and left Anfield to build a ground of their very own on Goodison Road. Left with a stadium but no players, Houlding enlisted the services of his friend McKenna, who used his contacts to find thirteen men from Glasgow willing to form a new team. The Scots-born team was humorously known as ‘The Team of the Macs’ locally. And so Liverpool FC was born, with ‘Honest’ John as its first manager. McKenna wrote to the Football League, asking for the new team to be admitted to its ranks, but they refused. That first year (1892/93), Liverpool played in the Lancashire League instead, emerging as victors by the end of the season. Promotion to the Football League Second Division followed and by 1901, Liverpool had become League Champions for the very first – but by no means the last – time. And the rest, as they say, is history. As for ‘Honest’ John, from 1906 to 1915 he served as chairman of Liverpool, followed by his election to President of the Football League in 1917, a role he held until his death in March 1936. His coffin was carried through the streets of Liverpool by three Reds and three Everton players and the influential Irishman was buried in Smithdown Cemetery (also known as Toxteth Park Cemetery). There are also commemorative plaques recording his achievements on display at Anfield and in his home town of Glaslough, County Monaghan. Louise McTigue is a freelance writer and researcher, writing on behalf of Sarsfield Memorials Liverpool. Here at Sarsfield Memorials Liverpool, we’re fascinated by the way people’s lives – and sometimes their deaths – have shaped the history of Liverpool. Over the coming weeks and months, we’d love to share some of these stories with you. In this, the centenary of the beginning of the First World War, we are especially keen to commemorate these Liverpool Heroes, brave men who helped fight for our freedom and are now laid to rest in Liverpool cemeteries. So check back regularly to find out more about the people who have contributed towards making Liverpool the place it is today. William Ratcliffe was born in Toxteth in January 1884. At age 17, he joined the South Lancashire Regiment and fought in the Second Boer War and India. After his discharge, he worked for a spell at Liverpool Docks, but must have missed the adrenalin of the army – he was one of the first to enlist when World War I broke out. He was decorated with the Military Medal in early June 1917 for his “acts of gallantry and devotion to duty under fire”. On 14 June 1917, William was a stretcher-bearer in the 2nd Battalion South Lancashire Regiment during the Battle of Messines, bringing fallen soldiers in for medical treatment. As the battalion advanced into German trenches, he was horrified to see his comrades being strafed down by an enemy machine gun to the rear. Without awaiting permission, William rushed the enemy and single-handedly defeated them, bringing the gun back through a hail of sniper bullets. He gamely held his post, firing repeatedly on the enemy as the battle progressed. And when he was done, he spent the remainder of that night back on stretcher-bearing duties, bringing the wounded in under a heavy barrage of fire. For this, he was presented with the Victoria Cross, the highest military decoration awarded for valour “in the face of the enemy”, by King George V on 26 September 1917 at Buckingham Palace. After the war, he returned to his former employment on the Docks, but was forced to retire after an industrial accident. He was reluctant to attend a celebration in 1956 to mark the centenary of the Victoria Cross because he couldn’t afford a new suit. But a local tailor intervened and William took his place among his fellow surviving VC holders at the ceremony in Hyde Park after all. 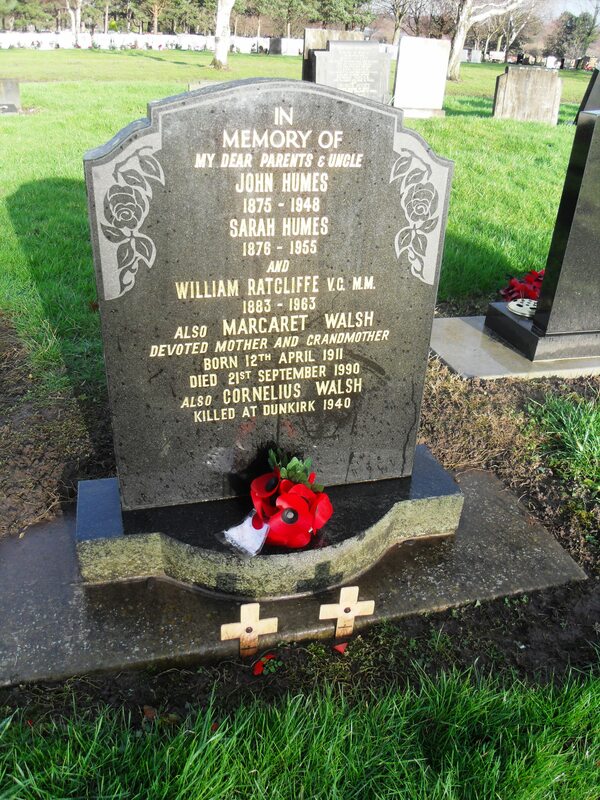 On his death in March 1963 aged 79, William Ratcliffe was buried in Allerton Cemetery. He never married. His VC and Military Medal are on loan to the Imperial War Museum, London, while the gun he captured at the Battle of Messines is proudly on display at the Lancashire Infantry Museum.